How to deal with chemical aggressions, chlorinated, thermal, saline or acid water, pressurised water jets, wave movement, etc.? - Fissuration of tiles subject to water pressures or counter pressures when the swimming pool is empty. - Disbondment of tiles if the adhesive mortar used does not have the requisite adhesion properties. - Degradation of the joints due to chlorine and maintenance products. 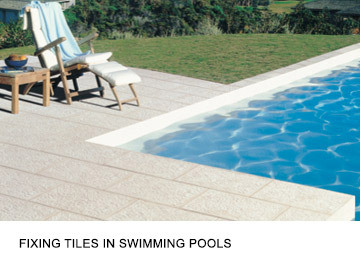 • Use frost proof tiles for exterior swimming pools. • To ensure good water proofing, use CERMIPROOF with high flexibility components. • For the jointing, use cement based or epoxy products: CERMIJOINT TX - EPOGLASS - EPOSOL - CERMIJOINT HRC resistant to chemical aggressions. • Wait 7 days after jointing before bringing into contact with water. SUITABLE SUBSTRATES: cement based, concrete or cement mortar. • water proof, stable substrates. • Water proofing: bulk water proofing only. Special substrates: polyester shells and resin, stainless steel partitions, etc. Please consult us. • Substrate drying and ageing times: Concrete: 3 months. Cement based finishing coats and screeds: 1 month. • Condition of the substrate: clean and dry, dust free. Clean the concrete with a high pressure water jet or by sanding. • Water proofing of basins: use CERMIPROOF two component under tile liquid damp proof protection system (SEL), which ensures water proofing and reinforces that of the existing concrete lining. • Double spreading obligatory (apply a thin layer of adhesive onto the back of the tile with the appropriate notched trowel for the type of tiling). • Allow for sufficient inter-tile joints of 3 to 10 mm. b) sea water, thermal water or aggressive water, water 33-38°C, frequent acid cleaning, public baths: EPOGLASS - EPOSOL (on floors) specially recommended.